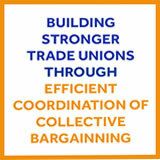 IndustriAll Europe has designed a project which combines coordination of collective bargaining, trade union involvement in the Semester and capacity building. With this project we set an ambitious agenda in order to come up with answers to the challenges that we and our member organisations are facing. Our project, which will run from November 2016 until October 2018, involves training, surveys, reports and a review of previous policy decisions. The project will aim at providing knowledge and a policy platform for national trade unions affiliated to industriAll Europe in order to defend the autonomy of the social partners in collective bargaining, to maintain multi-employer bargaining and to promote quality employment and high social standards, combat social dumping, etc. The training aspect is essential to the project. The topics will be adapted to each region with best case examples and exchange of experiences by affiliates. Some of the invited speakers will be researchers/specialists/trade union officers from the regions.